We’ve already established my love of Black Friday (you can read my Black Friday Survival Guide here for advice on how to shop BF like a pro). Now I’m linking up with my friend Della from Della Devoted to show you some of what we’re planning to purchase during the sale. Some stores have already started their deals, like Vera Bradley and Kohl’s, and I highly recommend you check out both. Anyways, here’s a preview of what I’ll be shopping for at Bath & Body Works and Old Navy, as well as some of the toys I’ll be purchasing for Kane. I’ve always had awesome success at B&BW. They usually have Buy 3, Get 3 free on their signature body care, 2-packs of Wallflowers for $5, the $20 VIP bag, and the ability to stack coupons (in-store only). I was told by a store associate that their Black Friday information should be emailed tonight, so I will update this post as soon as I know exactly what deals they’ll be running this year. I love this year’s VIP bag, and I hope it’s the same price as usual!!! UPDATE: The entire store will be mix & match buy 3, get 3 free! Old Navy is an all-around family favorite. Here are some of the items I have my eye on. Old Navy currently has 30% off their entire store/website today with code EARLYBIRD, but I’m holding out for tomorrow and Friday’s deals, which are better. The entire store will be 50% off, and the website will be up to 50% off. You can see the deals here, and they start online at midnight! I’m really looking forward to Kane opening gifts this year, because I think he will REALLY enjoy ripping the paper! Here are some of the items I’ll be purchasing for him. I actually already purchased the Little People Fun Sounds Farm–it’s on sale for $29.99 on Amazon, which is $10 less than it is elsewhere. The VTech Go! Go! set will be $25 at Walmart, and the cars that accompany it will be $5 each starting at 6 p.m. on Thursday. Everything else is from Kohl’s–they are having excellent deals on most all of their toys, so I suggest that mommies take a good look there! And just a reminder–use Ebates! They always have extra special cash back deals on Black Friday and you can really ring-up the cash!!! If you want more info on how Ebates works and how awesome it is, you can read my post about it here. If you want to sign up, you can use my referral link by clicking on the logo below. Click here to go ahead and get started if you’re too excited to wait! 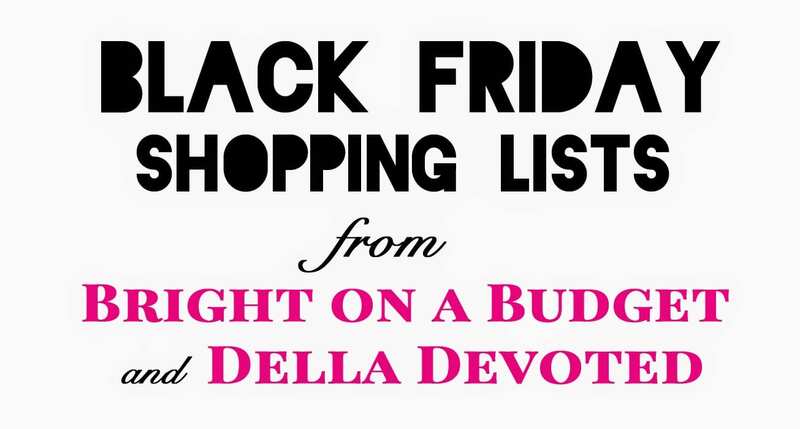 Don’t forget to hop over to Della’s blog and check out her list as well! I hope this gives you some Black Friday shopping ideas! If you’ll be out shopping, what are you hoping to score??? Great finds!! I'm staying in a scoring the deals online!! Happy Thanksgiving and Happy Shopping!! Thank you for this. I always seem to be so clueless when I set out on black friday and it always ends up a nightmare!! Man, I haven't done Black Friday for YEARS! I may have to do some online stuff. I just can't stand those crowds! Your picks look great – way to plan ahead. We have some of the Go Go Smart Wheels sets and I got my son the train one for Christmas too. Found it at Costco on a really good deal. Love your suggestions!